Small carved blocks of ivory were used to fasten one length of sea mammal hunting line to another without making a knot. Using this method, lines with loops on their ends – for example, the leather cords attached to harpoons and sealskin buoys – could be quickly joined and just as easily separated. One loop passed through holes in the block while the other slipped around its grooved contours. 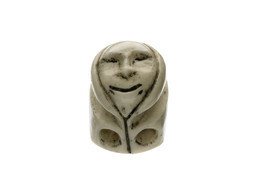 This line attacher was carved from a walrus or beluga tooth, in the shape of man’s face. Dots representing labrets appear below his mouth.